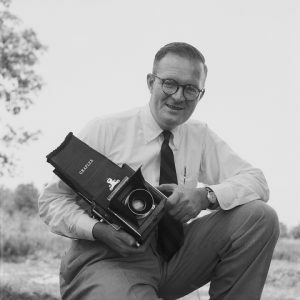 Wilmington, N.C. — See North Carolina through the eyes of Wilmington-born photographer Hugh MacRae Morton (1921-2006). His captivating images will be featured in the traveling exhibit Photographs by Hugh Morton: An Uncommon Retrospective, is now open at Cape Fear Museum. The exhibit is on loan from the UNC Library’s North Carolina Collection Photographic Archives and will be on view through September 2018. To create Photographs by Hugh Morton, Stephen Fletcher, photographic archivist at UNC Library’s North Carolina Collection Photographic Archives, selected images from the library’s collection of Morton’s estimated quarter-million negatives and transparencies. Fletcher and his colleagues used high-resolution digital scans from Morton’s original negatives and transparencies to create prints for the exhibit. “We are pleased to bring some of Hugh Morton’s best work to Wilmington, where he was born. This collection shows his love of North Carolina’s people, places and events,” says Museum Director Sheryl Kingery Mays. Photographs by Hugh Morton covers Morton’s various experiences as a photojournalist; as a soldier in the Pacific Theater during World War II; and as owner and operator of Grandfather Mountain tourist attraction in Linville. The exhibit’s more than 50 images feature dozens of his lesser known or unpublished photographs, as well as some classics. The exhibit will also feature brochures, postcards and prints featuring Morton’s images from Cape Fear Museum’s collection. Morton’s photographs reflect his passions as an avid conservationist, environmental activist, sports fan and tourism booster in the Tar Heel State. Visitors to Photographs by Hugh Morton also will discover that he was a prominent businessman and political figure in the state. University of North Carolina-Chapel Hill basketball player Vince Carter dunking during the Nov. 22, 1997, game against the University of California at Berkeley. Come to Cape Fear Museum for a glimpse of North Carolina during the 20th century. Learn more about the accomplished Wilmington, N.C., native who contributed so much to his beloved state.